Some of the angel names listed here appear in sacred texts of Jewish and Christian beliefs, including the Bible and apocryphal texts like the Book of Enoch. Other names come from lore and mythology. And a few of these angelic names also appear in literary works. This is by no means a definitive list. 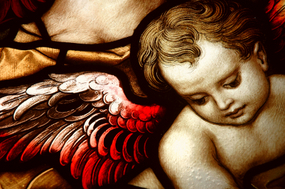 Consider it as a brief compilation of some the best-known, most popular names of angels. I hope you enjoy it. Words have power. Names are supposed to capture the nature of the person or place they represent. So, when looking for names, most people want to know the meaning behind them. Many of these heavenly names are not only beautiful, but also carry a mystical (and powerful) force. I hope you enjoyed going through this list of celestial names. More Names of Angels - Find here more angelic inspiration. Archangel Names - A list of the best-known "chief angels". Angelic Names - Selection of names inspired by the word angel. Names of Male Angels - A list of known and not-so-well-known male angels. Female Names of Angels - Are there female angels? Here's a selection of several names of female angels and other female angelic names. Fairy Names - A page devoted to names of fairies and magical beings. Fairy Baby Names - Another page filled with enchanting and magical names. Female Fairy Names - A collection of unique names of female fairies. Magical Names - Names from mythology, lore and legend. Mystical Names - Magical names from ancient traditions and more. Fantasy Names - More names of fantasy creatures. Mythical Names - Names from myth and legend.